Are you looking for clothing label woven onto a white satin square with standard measurement? We can weave satin woven label in any dimension, and any colours. We also add double white threads on white Satin Woven Label so that the satin isn’t too thin, and that the fabric of the clothing isn’t showing through. Contact us on below email to start costimizing a white satin woven label. We are a professional custom woven label manufacturer for more than 20 years now. 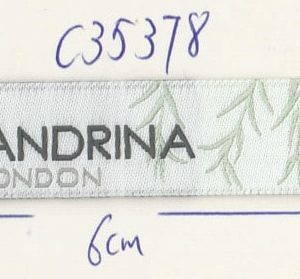 Our custom woven labels can be used for fashion clothing industry, home textiles market, hand-made items, soft furnishings, car industry, woven textile ribbons, and fashion accessories. We have a professional art design team to deal with label design artwork and weaving technique team to convert the label design artwork for weaving machine. Our white satin woven labels are of the highest quality and our manufacturing low pricing keeps our customers coming back again and again for repeated orders and new label designs. Many of our customers just have a logo for their start-up clothing business and they contacted us to seek a bit of help with putting things together for customizing a professional brand clothes label. Send your brand label design artwork on below email, we will offer you a quote and produce a custom-made sample to get your approval before manufacturing your labels.